Getting leads for seven digit deals. With a solid brand identity and message, Westmark Construction now consistently gets leads month after month and has solidified their presence as a pillar in the industry. A overall marketing puzzle with rough and missing pieces. 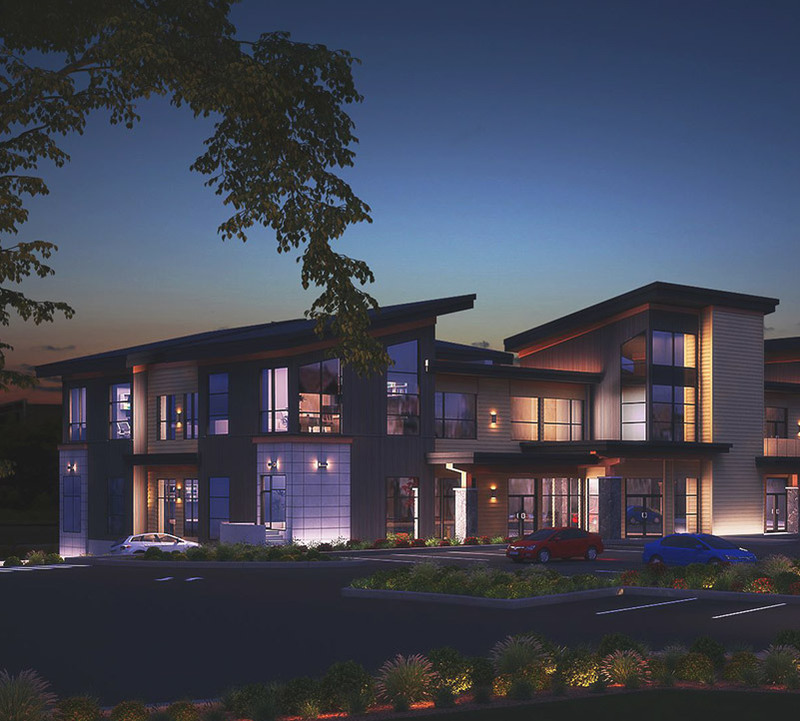 Westmark Construction is a custom home and commercial builder with all of the ingredients for success: a highly-refined construction management process, a dedication to quality craftsmanship, and a host of happy clients. However, they were trying to work with a fragmented collection of marketing assets without a clear alignment to their organizational goals. The lack of cohesion left them without a reliable measure of ROI and hesitation about investing in future marketing efforts. 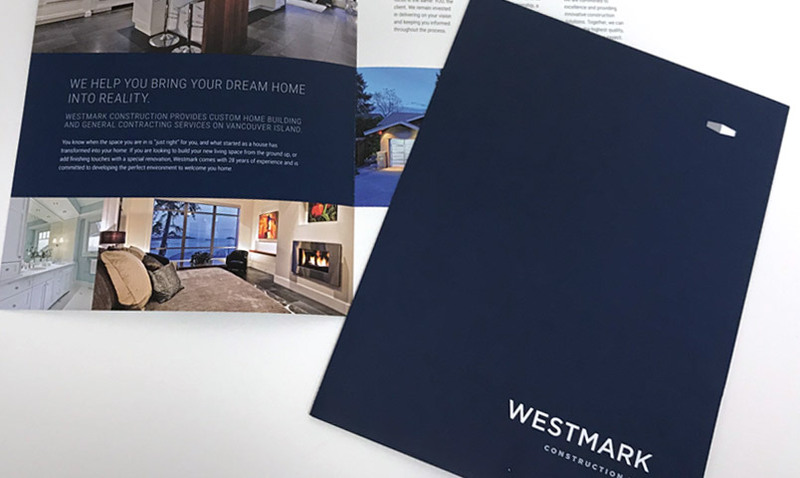 Westmark wanted to consolidate their marketing direction – they needed clear objectives identified, and a concrete plan for getting there. They reached out to Array in 2015, looking for a fresh perspective, an expert opinion, and an all-inclusive project management approach which mirrored theirs. An established brand is redefined and strengthened. For the brand refresh, we refined the chunky wordmark – the sophisticated font selection harmonized with the clean minimalism of the icon instead of competing with it. New Brand Standards documentation identified clear, appropriate use of the brand across all applications. We crafted the website’s narrative tone to be approachable and open, while also instilling confidence. This tone naturally became the core of their brand voice. A fresh, modern user experience focused on a target audience. The unique grid-style layout resemble building blocks represent solidness, and a colour palette of neutral medium gray with accents of navy invoke trust and assurance. A full inventory was taken of the existing website, and we clearly identified Westmark’s objectives for their new web presence. We understood that there would be two distinct audiences, and tailored the copy and user experience to speak to their pains and give them the concise information to make confident decisions. A unified message is delivered to prospective clients. 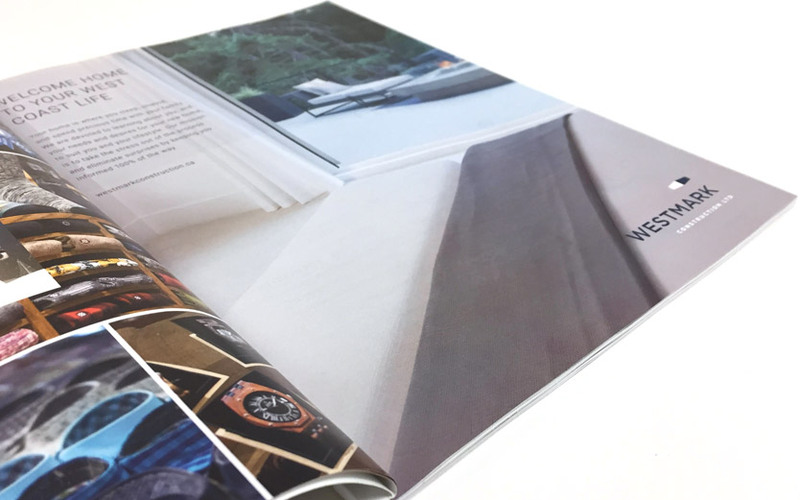 The refined visual brand and voice was carried through into Westmark’s print collateral, further solidifying their identity. Vehicle decals and site signage give passersby a clear, memorable impression of the company. Business cards, presentation folders, and brochures focused on select target audiences enhance those first client touch points. 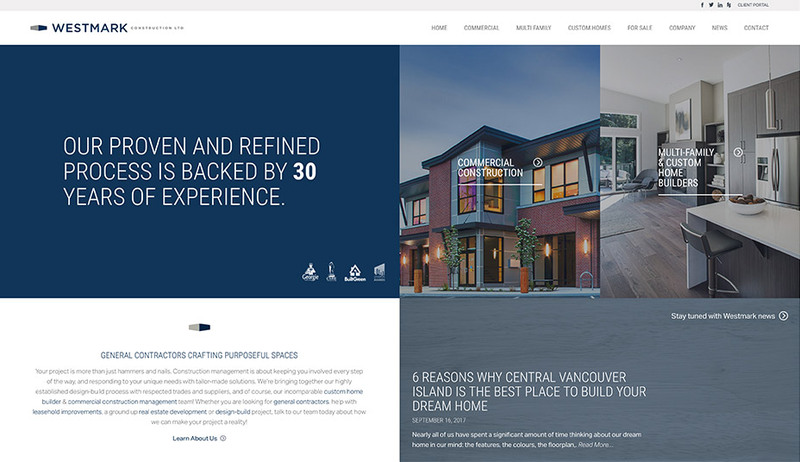 Thoughtful copywriting is a supportive extension of the website narrative, and we helped them communicate their refined building process. A strong strategy builds brand awareness and generates leads. As a big-picture marketing consultant, Array plans and executes a steady, sustainable strategy. A long-term investment in search engine optimization, both on- and off-site, has resulted in top search rankings, and provided further insight into the demographics and behaviours of their target audience. This has informed complimentary successful traditional, print, and digital marketing efforts, including print publication and online pay-per-click ads, crafting keyword-focused blog articles. The website sales funnel has been honed to generate more qualified, actionable leads. Building on impressive results year over year. Westmark’s clients frequently provide feedback about how well the website works, how it is easy to navigate and inspires confidence in their services. 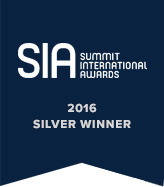 To us, that’s a huge win – our overall goal for every project is to create a message that resonates with the target audience. The website consistently ranks in the top of Google Search results for our key phrases identified in our analysis. In fact, Westmark has recently requested we dial back our assertive efforts, as they are getting more leads than they can handle! 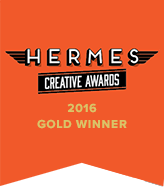 In 2016, the Westmark website received two international creative awards: a Silver in the Website Redesign Category for the Summit Creative Awards, and Gold in the B2C Website category for the Hermes Creative Awards. Our team will get back to you ASAP about what budget a project like Westmark Construction requires.